When Jill Zielinski (a.k.a. Knitterella) did my snazzy new pattern layout, I decided to redo some of my previously published patterns with the new look. I’d be selective about it—redoing layout takes more time than one would think (at least, if I’m doing it), and that time often would be better spent making shiny new patterns—but there some of my earlier patterns are still pretty popular, and I’d like the good people who buy them to have the best version I can give them. 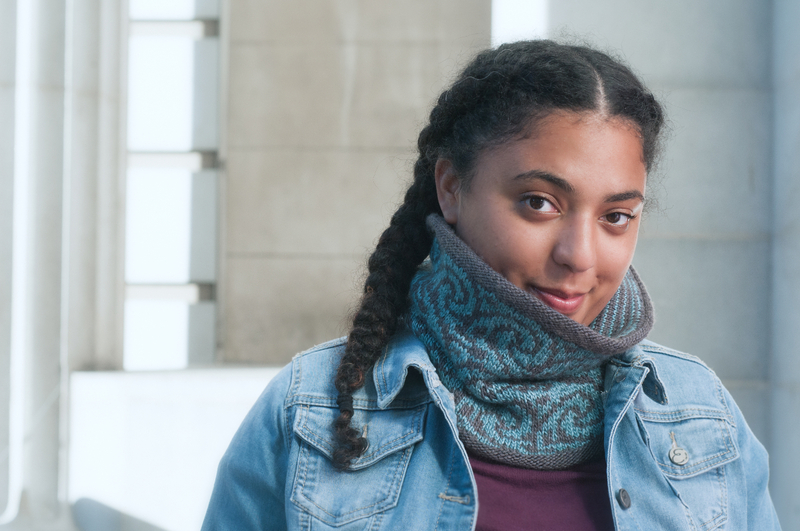 On the top of the list was Gyre: my swirly, colourwork cowl with the optional striped lining. This pattern needed new photos, though, and it took a while to get that together. 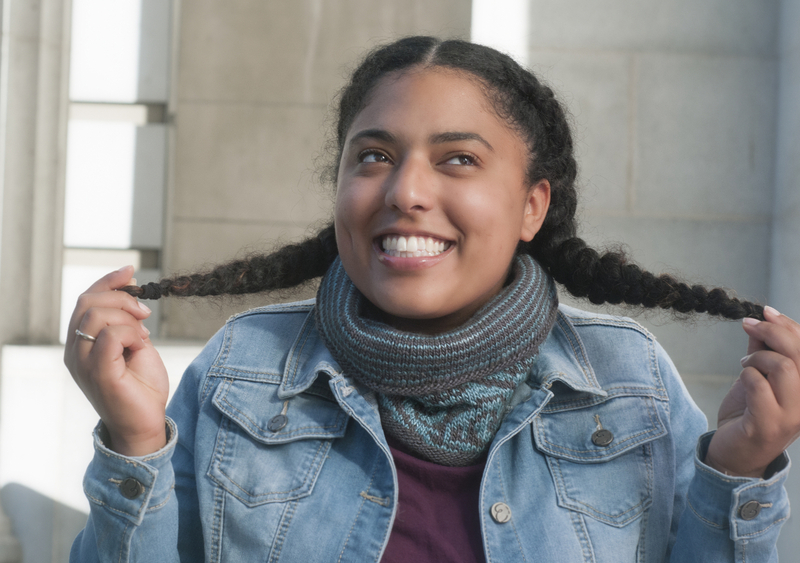 Now the new photos are here, and they’re fabulous (in my not-unbiased opinion, and thanks entirely to the talented Gale Zucker and model Ariana McLean), and it’s time. 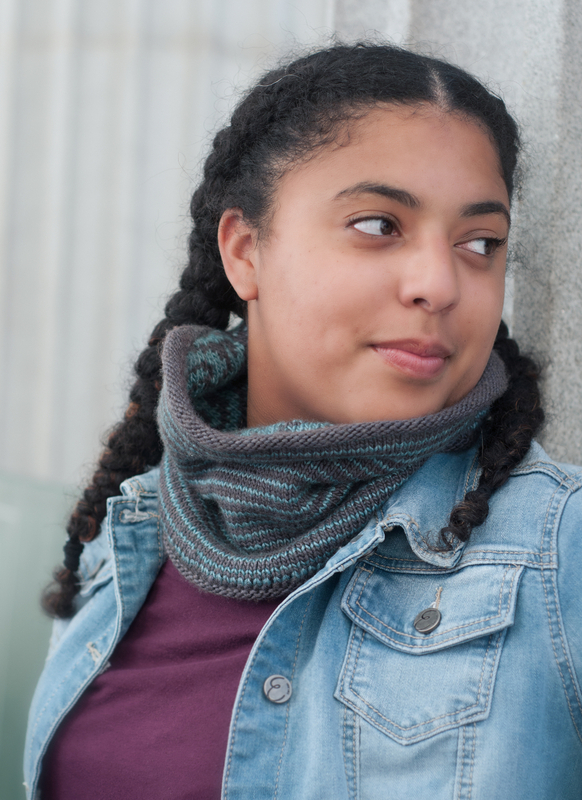 The new version of Gyre is now on Ravelry, and it’s 30% off until November 10. You don’t need a coupon code: the discount will be applied at checkout. For another, some of the links—important ones, to tutorials on provisional cast ons and the barber pole stripes used in the lining—now lead to dead pages, and better tutorials have been published. I fixed the links, pared down the pattern text, and redrew the chart in Stitchmastery, which is much better software than I’d originally used. I changed the text order so that the information you want with you while you work is all together, and the information you refer to at the beginning and only occasionally while working is on separate pages. This is the unlined version. It’s still pretty cozy. 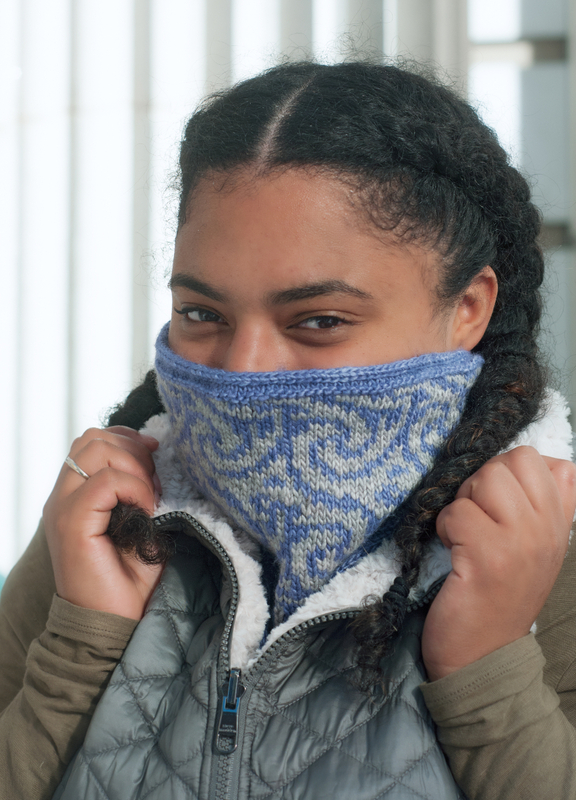 The pattern for Gyre is the same price as before: $5.50; with the sale discount you can get it for $3.85. Click here for full pattern information, or here to pick up your copy now. And now, I’m off to Asheville, North Carolina to visit a beloved friend and check out the Southeastern Animal Fiber Fair. Back next week with photos of sheeps and mountains and maybe knitters in tutus. I tis such a JOY to photograph your designs! I blogged about Gyre today, too. Now, I need ot get going and knit myself one. Thank you so much, Gale! I can’t wait to get the next round of samples done to see what you do with them.